Ants in the kitchen? Fun fact: They hate citrus juices and chalk. The presence of bugs is one of the lesser qualities of springtime, but in most places it is unavoidable. Seeing a spider or a line of ants outside near landscaping is hardly a cause for concern. After all, bugs belong outside. So, why are you seeing them inside your seemingly clean apartment? 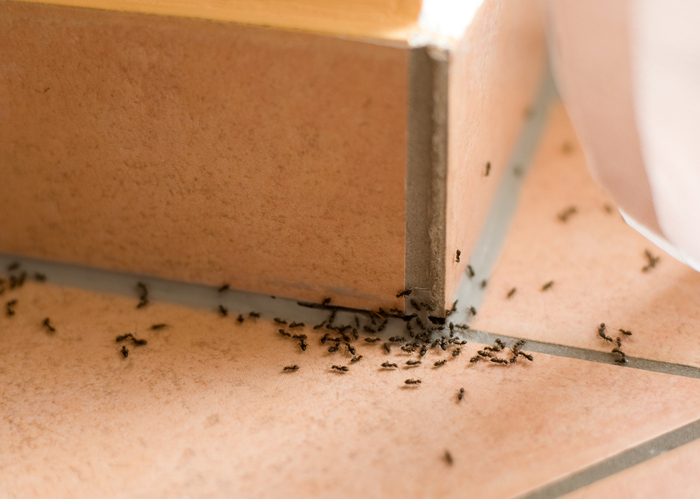 Let’s talk about how you can prevent ants and other bugs from coming into your beautiful St. Mary’s County apartment. One of the most common and frustrating signs that spring has sprung is the presence of ants in the kitchen. Ants hibernate throughout the winter, surviving on a supply of stored fat. When the weather warms up, ants begin to emerge from their nests to seek food and water. Due to their tiny size, they are fairly capable of getting into any home or apartment through various entry points if they sense that a food source (even as miniscule as a crumb) is nearby. Do your best to identify and seal or cover any entryway gaps or cracks you notice. Do not expect this step alone to fix a pesky pest problem. Spraying the entry point with a strong odored cleaner can deter many bugs. Ants, specifically, do not like citrus juices or chalk – so consider outlining the entry point with chalk and splashing a few drops of lemon juice nearby. Looking For an Apartment in St. Mary’s County That You’ll Love? We Can Help! This entry was posted on Friday, May 13th, 2016	at 7:08 pm	. Both comments and pings are currently closed.